Samsung gradually being pressed by clients like Apple to use renewable energy. The companies also have a number of global clients and partners that belong to RE100, a global campaign to go 100 percent renewable in offices, buildings and production plants. The 155 member companies include Apple, BMW, Volkswagen, Google, Facebook, Coca-Cola, Bloomberg, Burberry, General Motors and Goldman Sachs. 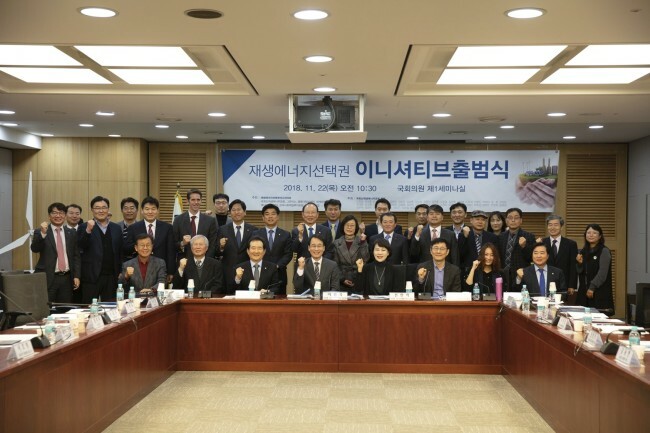 “Samsung Electronics in its business-to-business deals is gradually being pressed by global clients, including Apple, to use renewable energy for the production of the parts we supply,” said Kim Ji-young, a chief of Samsung Electronics’ global EHS center, during the forum at the National Assembly. “We are also in cooperation with Apple for benchmarking (the use of renewable energy). Apple also told (Samsung) that the obligation to use renewable energy may be included for the production of chips in a few years (although unofficially),” Kim said. Despite the increasing pressure from global clients, Korean companies face limitations in the extent to which they can replace their existing power sources with renewables. In Korea, the state-run Korea Electric Power Corporation — the only power provider here — is unable to classify power according to how it was generated. That is, Kepco cannot tell consumers whether power comes from renewable sources, coal, liquefied natural gas or nuclear energy.